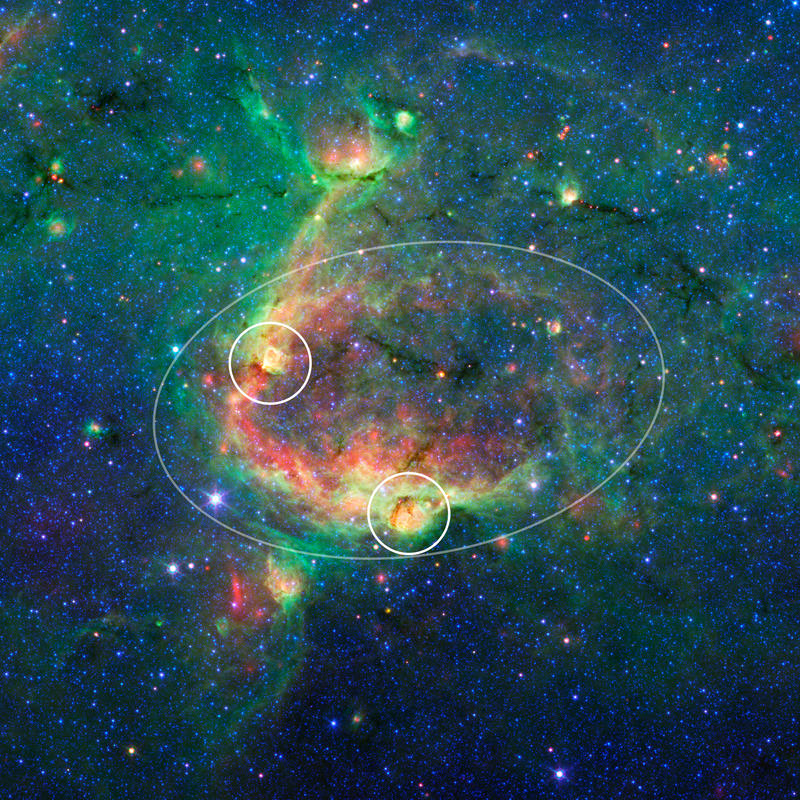 This infrared image shows a striking example of what is called a hierarchical bubble structure, in which one giant bubble, carved into the dust of space by massive stars, has triggered the formation of smaller bubbles. The large bubble takes up the central region of the picture while the two spawned bubbles, which can be seen in yellow, are located within its rim. NASA's Spitzer Space Telescope took this image in infrared light. 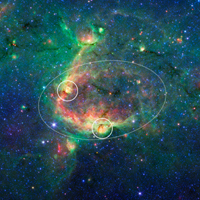 The multiple bubble family was found by volunteers participating in the Milky Way Project (see www.milkywayproject.org). This citizen science project, a part of the Zooniverse group, allows anybody with a computer and an Internet connection to help astronomers sift through Spitzer images in search of bubbles blown into the fabric of our Milky Way galaxy. 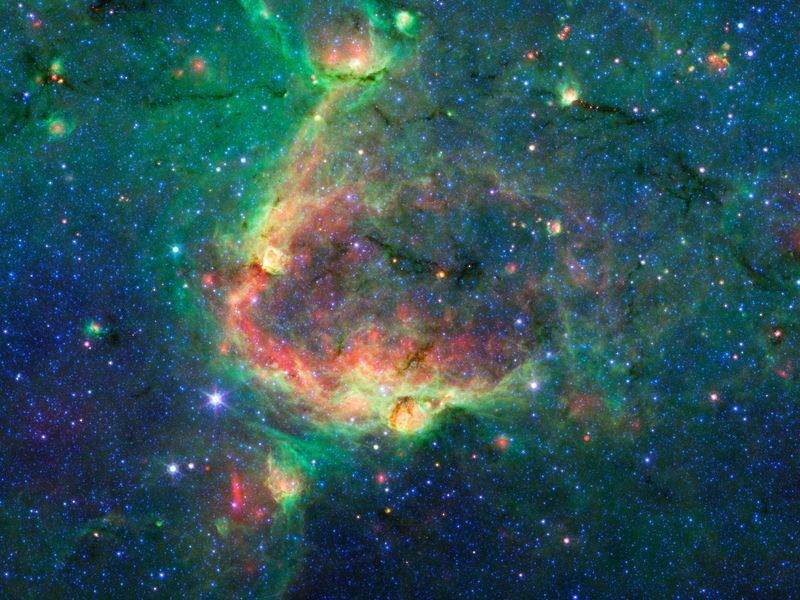 The bubbles are formed by radiation and winds from massive stars, which carve out holes within surrounding dust clouds. As the material is swept away, it is thought to sometimes trigger the formation of new massive stars, which in turn, blow their own bubbles. 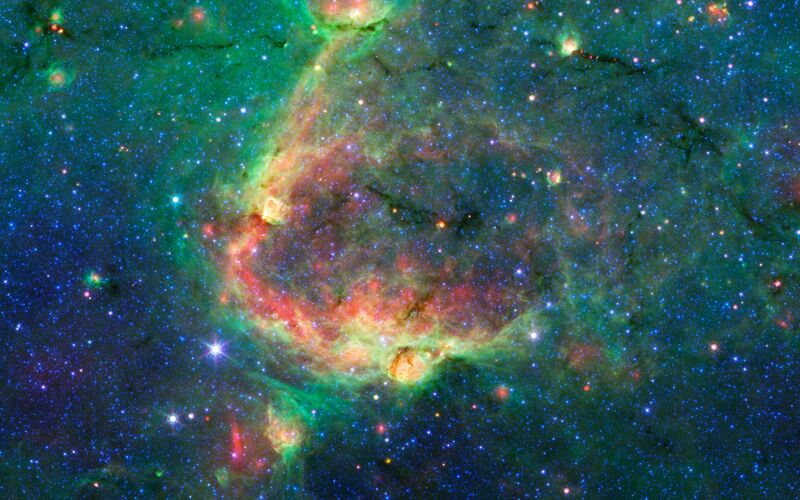 The images in the Milky Way project are from Spitzer's Galactic Legacy Infrared Mid-Plane Survey Extraordinaire, or Glimpse, project, which is mapping the plane of our galaxy from all directions. As of June 2013, 130 degrees of the sky have been released. The full 360-degree view, which includes the outer reaches of our galaxy located away from its center, is expected soon.